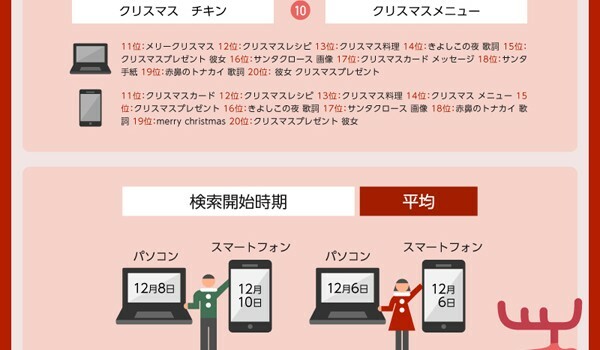 It starts with an authentic resource…and this one from Yahoo Japan about the top 20 Keyword searches related to Christmas via infographic.jp (an awesome source for Japanese language infographics!). Yes we have touched on the typical “holiday in (fill in country)” but I want them to use the information to infer about what the Japanese really feel about this celebration (a non-holiday) in the country. The lesson is applicable to any county/celebration. Key note – This was a ‘first day back‘ after holidays activity and we used the information to guess/infer in English about what we learned reading the infographic. For other times/units we would use the target language. Here’s how I set it up. Pick the ‘meatiest’ part: I decided to concentrate on one specific part of the infographic – the actual top 20 terms as searched for on home-based and mobile devices . It’s easier to print out part of the graphic and is the piece of information that I found the most relevant. Step 1 – Establish some prior/new vocabulary knowledge. This is where any new vocabulary (or in my case ‘characters’) was placed. Students read over the list with their partner first (no dictionaries) and guessed/filled out words that they already knew. Then they used resources to find ones they did not. We then discussed this as a class – which allowed me to clarify meaning and identify any cultural implications of using the word. Step 2 – Reading/Understanding the Information. 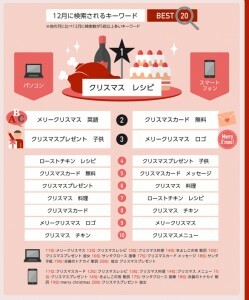 I gave them the ‘actual’ piece of the infographic in Japanese (above/right). But the small print is hard to read and so I replicated the lists on another – typed out (and with furigana reading for the Chinese characters). Their instructions were to read through the lists and NOT to translate them. (That is not to write the English meaning directly beside the Japanese). If they had a word they had to look up they could write that out there (as they are using the lists for later questions). After reading with their partner they should be able to understand the words/phrases on both lists. Step 3 – The “Deeper Thought” Exercise. I didn’t want a ‘list’ or a ‘regurgitation’ of the information. So they were asked to answer 5 questions (with their partner) in English about what they read. The KEY for me were questions 1 and 5 – with questions 2, 3, 4 setting them up for the final one. If you went only by internet searches given here …what are 5 key elements/components of a Japanese Christmas (and why did you choose them)? Is there anything in the top 1-10 for home computers that is not there in the 1-10 for mobile devices? Is there anything in the top 1-10 for mobile devices that is not there in the 1-10 for home computers? Is there anything in the 1-20 lists for the home computers or mobile devices that is NOT there for the other at all? Why do you think there are differences in the rankings between the two? What about when/how each device is used might influence that? As I indicated the key questions are the first/last ones. We discussed as a class what emerged as the key elements and how it related/didn’t to the Canadian Christmas experience. When it got to ‘why’ the home-based/mobile device searches might be different students came up with great ‘thoughtful answers’ that touched on demographics, timing, personal privacy, convenience and more. The students told me they really enjoyed the exercise because it used something ‘real’ and they especially liked the ‘deep thought’ questions as opposed to just ‘find the answer’. Several tables even ended up in spirited discussions about ‘why’ the lists were different. This was a great ‘first day back’ activity for me, meaningful for the students and a way for them to use real authentic information to learn about the TL country and ‘culture’. I have never been successful with printing out the infographics from this website mentioned in your blog. Could you give me any tips on how to print out a clean copy? It is frustrating for me as well. The only way I have printed the ENTIRE infographic is using a giant sized printer in our tech department that can print poster sized. It printed then in a 1 1/2ft wide x 5 feet long size. Failing that I do what I did for this activity which is to save the infographic as a jpeg – then copy/paste a portion into a Word document to use. Or I have ‘cropped’ the document to get the parts I want. There are some sites that will allow you to print out an infographic piece by piece – this blog (http://www.freetech4teachers.com/2012/04/how-to-print-posters-using-standard.html#.Vp540PH5ii4) has some ideas but I’ve never been successful. Those are my only solutions so far!